For the third consecutive year Paloservices and volunteers from Desmos.org gathered large quantities of oranges that will be donated to families in need. The orange harvest took place at the headquarters of Paloservices, in Kokkoni Corinth. 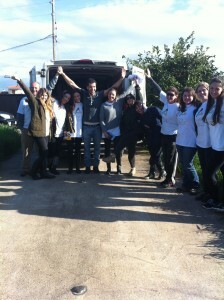 On Saturday March 7th, the Paloservices team along with volunteers from Desmos.org, joined forces at the Company’s estate in Kokkoni Corinth for the orange harvest. More than 1,5tons of produce was collected and delivered -the same day- to the Orthodox Women’s Association ” St. Philaret the Merciful” for distribution to impoverished families in the Municipality of Fylis. This action is part of the greater Paloservices Corporate Social Responsibility programme and the continuation of an initiative launched two years ago by the Founder & CEO of Paloservices Mr. Panayiotis Tsantilas. Mr. Tsantilas stated accordingly: “It is our pleasure to offer our support and assistance any way we can to help people in need. The annual orange harvest and donation of produce as well as our collaboration with Desmos is now well-established and will continue to take place in the future with even more initiatives”.